A majority of users observed that these backpacking boots run true to size. Many wearers noticed that there was minimal-to-no break-in required. The Salomon Quest 4D 2 GTX is a comfortable backpacking boot, according to most wearers. Although the shoe was not designed for winter hikes, a small percentage of buyers have used it in activities with snow such as shoveling and snowshoeing. Thick socks are necessary for warmth, as some suggested. Some mentioned that they experienced minimal-to-no blistering. A small number of users were dismayed over the issues with the plastic eyelets. They either pulled out of the shoe or snapped. An expert claimed that people with wide feet might not like the snug fit. A hiking boot reviewer was disappointed with the relatively thin underfoot which made him feel the ground more than the usual midweight backpacking footwear. The supposedly waterproof boot did not do its job of keeping water out, according to several online shoppers. A couple of them even complained that their socks were soaking wet. A few people didn’t like the construction of the boot because it was already coming apart after a few months of use. 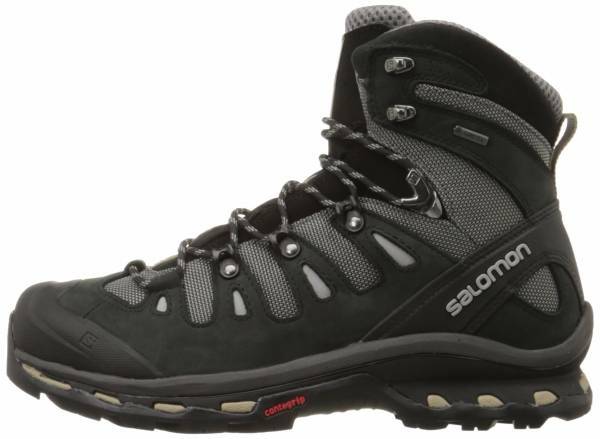 The Salomon Quest 4D 2 GTX is a backpacking boot packed with comfort and support. The comfort components deliver as the shoe has a lot of cushioning, requires little or zero break-in time and has a good fit. Its build is good enough to tackle snowy trails. The shoe has a snug fit in the forefoot zone, so it’s a big consideration for people with wide feet. Users also noticed some quality issues and complained about water leaking into the boot and its relatively thin underfoot. It is a little heavy, not it weight, but heavy in materials. This is the most durable boot that I've ever used and the most comfortable boot that I've ever used. This winner begs to be pushed to the limit, and it delivers time and time again. This is a solidly built, sturdy, midweight backpacking boot for backpackers and dayhikers who want better-than-average support and reliable waterproofing for carrying 30-40 pounds—without bumping up to a heavyweight boot. The Quest 4D 2 GTX is an over-the-ankle backpacking boot built for tackling challenging terrain. The designers incorporated Salomon’s 4D Advanced Chassis which is a technology based on trail running shoes from the footwear company. It’s a feature that provides protection and control when embarking on rough trails. Cushioning mainly comes from the EVA midsole. Additional cushioning comes from the Ortholite sockliner that provides a cool, dry and healthy feel to the foot. This insert comes with a heel cup for more cushioning and support. The Quest 4D 2 GTX is infused with Salomon’s proprietary Contagrip. It gives optimum traction on various wet and dry grounds. It is also non-marking and durable. The upper is lined with a Gore-Tex membrane to make the shoe breathable and waterproof. Water cannot penetrate the shoe and moisture caused by sweat can escape from the inside. The Salomon Quest 4D 2 GTX is a boot for both men and women. It is offered in regular sizes. The shoe comes in standard width. According to a retailer, these boots have a slightly wider toe box but are not considered wide. The forefoot was designed to accommodate natural toe-spreading. The women’s version is constructed using a women’s specific last. The shoe fairly runs true to size. The lace-up closure gives the wearer a custom fit. The gusseted tongue is padded and provides a streamlined instep fit. It also goes flat and smooth on foot for pressure relief while preventing debris and moisture. Contagrip is the technology applied for the boot to grip on various terrain. This technology mixes various compounds with varying densities. Some regions—such as the edges—of the outsole are harder while some are softer. Zones that are prone to wearing have high-density compounds so they won’t wear easily. Other zones have compounds of lower density for grip and flexibility. Low-density areas are usually in the central part of the outsole. This construction lessens the risk of injury when taking on various trails. The midsole has various cushioning components including the molded EVA that gives stability and lightweight cushioning. The shoe also comes with an EVA-shaped footbed that offers cushioning and anatomically-formed support. The boot’s Ortholite sockliner is a fusion of an EVA heel cup and a certain Ortholite foam. This insert provides long-term cushioning and absorbs shock upon impact. The open-cell PU foam lets air circulate in and around the sockliner. Its open-cell structure is the moisture management system that maintains the freshness of the foot. The heel also gets support and cushioning from the EVA heel cup. The user gains protection, foot control and functioning comfort with Salomon’s 4D Advanced Chassis. It is the platform that keeps the foot stable and cushioned when tackling uneven terrain. Placed between two midsole components, the chassis works with these parts to provide a responsive and stable ride. The midsole also has a thermoplastic urethane component designed for rough terrain. This TPU plate serves as the foot’s protection, improves stability, lessens ankle strain and aids in flex control. The Salomon Quest 4D 2 GTX is a high-cut backpacking boot that gives protection, stability and ankle support. The nubuck leather is a premium, full-grain leather that’s flexible, durable and long-lasting. The gusseted tongue of the boot has a material bridge that attaches the tongue to the upper so that water and debris cannot enter the shoe. The textile component is lightweight, abrasion resistant, breathable and quick drying. The footgear’s designers placed the Gore-Tex Performance Comfort lining to keep the foot dry. This technology is applied to the bootie of the shoe. Gore-Tex is a material that’s breathable, windproof and waterproof. The type used on the Quest 4D 2 GTX from Salomon is designed for outdoor activities under moderate and cool temperatures. The laces are made of sheath materials that give a tight grip and soft flex. They are secured by a lace locker. The knots will not untie during dynamic movements. There is a heel strap for easy on and off. The forefoot region has a rubber toe cap that serves as a shield from rocks and other obstacles that might injure the toes. There is also a rubber heel cap for protecting the rear of the foot. Another defensive component is the mud guard which is placed at the base. All three parts work together to make the shoe resistant to abrasions. The Ortholite sockliner is made using recycled tire materials for the protection of the environment. They are machine washable and can maintain their beneficial qualities after wash.
A retailer specified that it works with strap-on crampons. The 3rd version of the Salomon Quest 4D GTX replaces this boot.